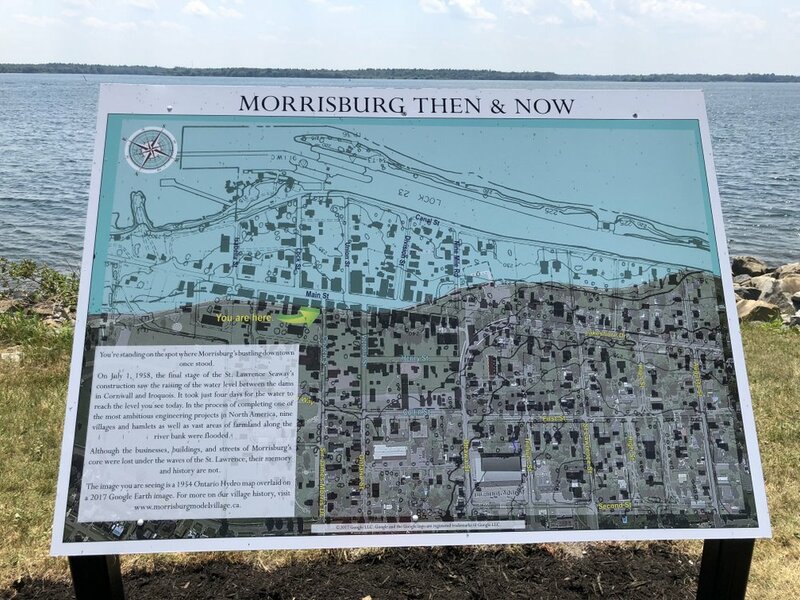 Depicting Morrisburg as it was before the Seaway flooding in 1958. 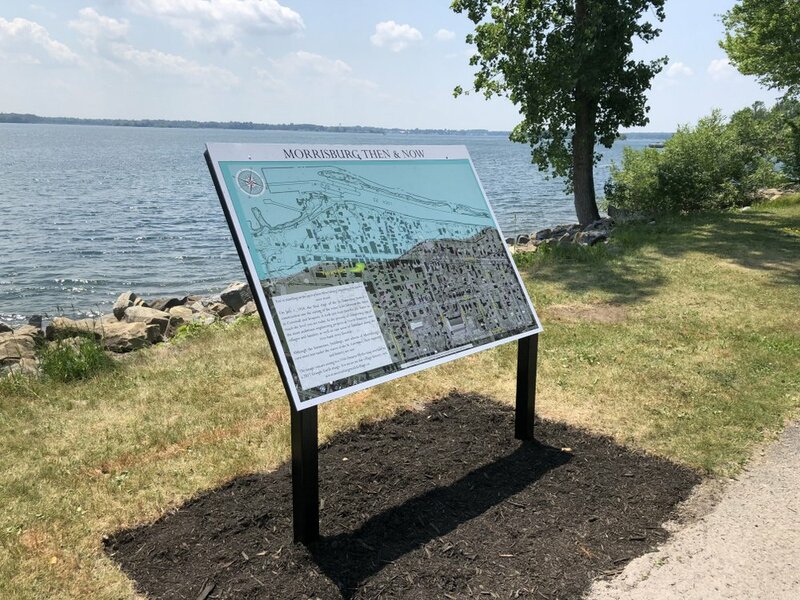 Directly linked to a new "Then & Now" Sign on the waterfront path - overlooking where the old Morrisburg downtown now lies under the St. Lawrence River. 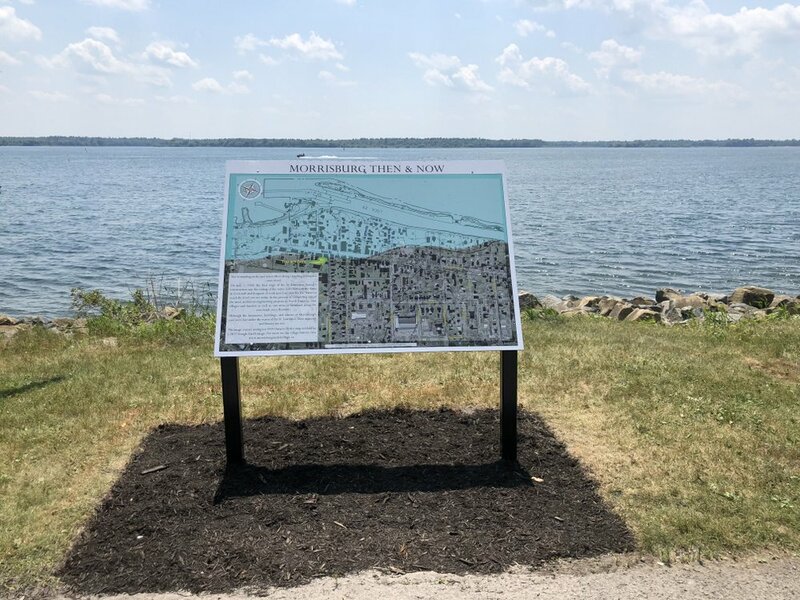 The Morrisburg Then & Now Sign is now in place on the waterfront path, just east of where it intersects the path from Canada Way. Why not take a look and let us know if you like it. Click below to see Google Maps Location. Click below to hear an audio description of the sign. 2) To add substantially to the hydro electric generation capability of the St Lawrence River for both Canada and the US. 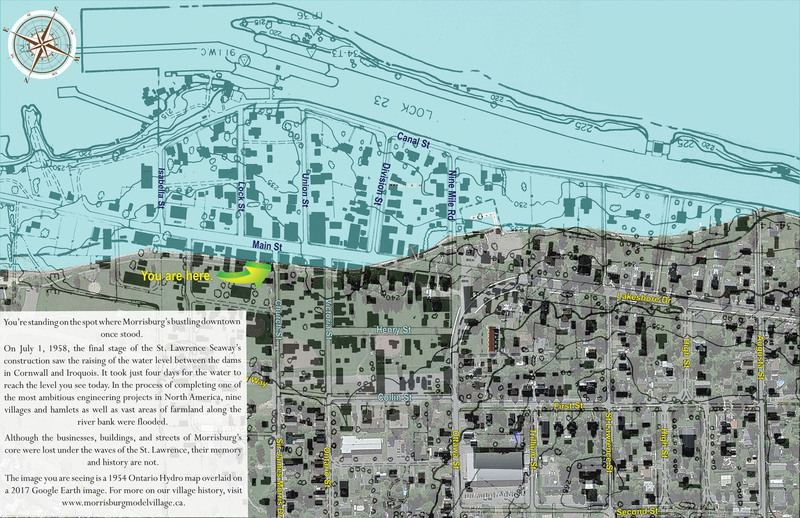 The major impact was to significantly raise the river water levels between the Cornwall Power Dam and the Iroquois Control Dam. This in turn flooded major areas of farm land and nine villages and hamlets that were lost altogether. 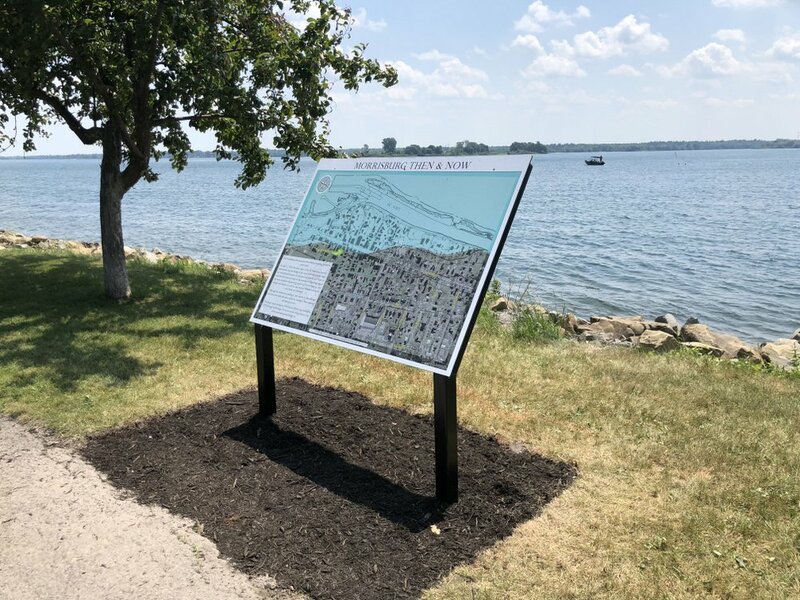 In addition most, of Iroquois had to be moved back away from the river and the downtown area of Morrisburg was lost under the St. Lawrence River. The flooding started on 1 July, 1958 when the temporary coffer dams were breached. It only took four days for the water to reach its new (and current) levels. The following links provide more information, including many pictures and maps: St Lawrence Piks Seaway History, Lost Villages Museum, Ghost Town Pix Lost Villages. 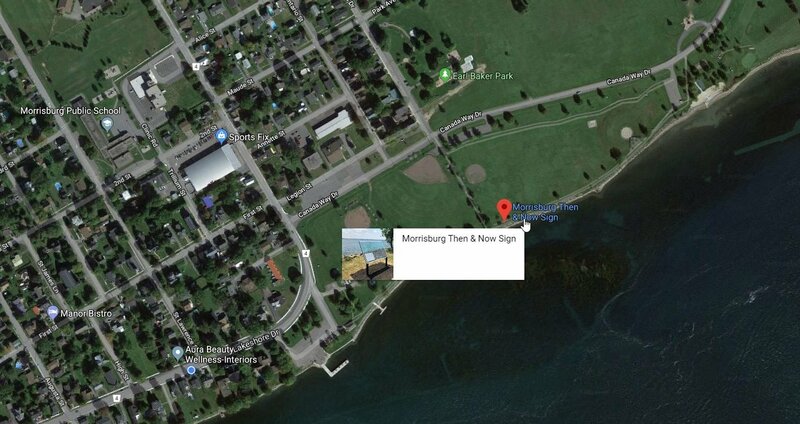 The Virtual Morrisburg Model Village includes the pre-seaway area of the village from Augusta Street in the west to the east end of old Lock 23 (south of the current location of the Cruickshank Amphitheatre) and from First Street in the north to the south end of Lock 23 (about 300m south from Cruickshank Amphitheatre shoreline). This is an area of about 920m E to W by 570m N to S.